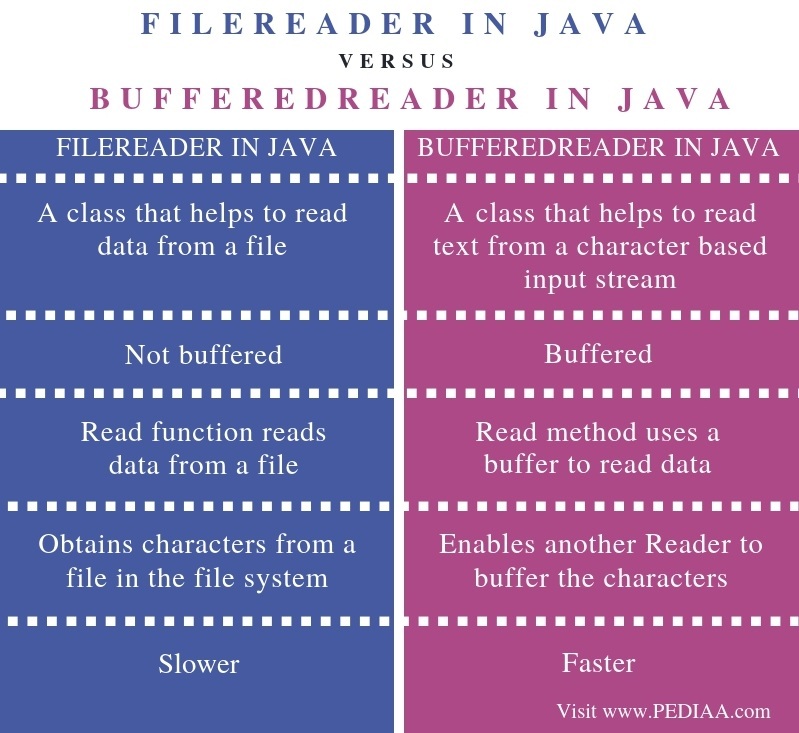 The main difference between FileReader and BufferedReader in Java is that FileReader reads characters from a file while BufferedReader reads characters from another Reader. Java is a modern programming language in software development. It allows object-oriented programming and provides features such as automatic garbage collector, support for multithreading, etc. Developers use Java for standalone, web, mobile and many other applications. Furthermore, it is also possible to perform operations on files using Java. Two classes to accomplish that task are FileReader and BufferedReader. FileReader is a class that helps to read data from a file. It returns data in byte format. FileReader class has the following two methods. int read () – This method returns a character in ASCII form. It returns -1 at the end of the file. void close () – This helps to close the FileReader object. Moreover, there are two ways to write the constructor. FileReader (string file) – Programmer passes the file as a string. It opens the file in the read mode, and if the file is not available, it throws FileNotFoundException. FileReader (File file) – Programmer passes the file instance. It opens the file in the read mode, and if the file is not available, it throws FileNotFoundException. An example is as follows. The file1.txt is a file with some characters. In the above program, there is an object of type FileReader. FileReader receives the path to the file1.txt file. The variable ‘i’ helps to iterate through all the characters in the file. The read function inside the while loop reads the characters in the file. It reads the characters until the file ends. At the end of the file, the read function returns -1. Then the loop exits. Finally, the programmer can close the FileReader object. BufferReader is a class that helps to read text from a character-based input stream. It reads characters using another Reader. Some methods in the BufferReader class are as follows. int read() – This method reads a single character. String readLine() – This reads a line of text. void close() – This method closes the input stream and releases the associated system resources. BufferedReader (Reader rd) – It creates a buffered character input stream that uses the default size for an input buffer. BufferedReader (Reader rd, int size) – It creates a buffered character input stream that uses the specified size for an input buffer. There is an object of type FileReader. FileReader receives the path to the file1.txt file. That object is passed to BufferedReader. The variable ‘i’ helps to iterate through all the characters in the file. The read function inside the while loop reads the characters in the file. It reads the characters until the file ends. At the end of the file, the read function returns -1. Then the loop exits. 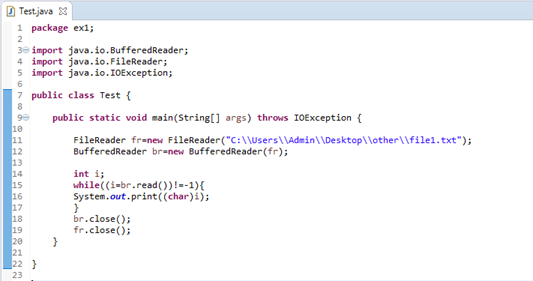 Finally, the programmer can close the BufferedReader and FileReader objects. FileReader is a class that helps to read data from a file. BufferReader is a class that helps to read text from a character based input stream. Thus, this is the main difference between FileReader and BufferedReader. Another difference between FileReader and BufferedReader is the buffering. That is; the FileReader is not buffered, but the BufferedReader is buffered. Furthermore, one other difference between FileReader and BufferedReader is that the read function in FileReader reads data from a file whereas the read method in BufferedReader uses a buffer to read data. Moreover, FileReader obtains characters from a file in the file system while BufferedReader enables another Reader to buffer the characters. Speed is another difference between FileReader and BufferedReader. FileReader is slower than BufferedReader. FileReader and BufferedReader are two classes to perform operations on files. The main difference between FileReader and BufferedReader in Java is that FileReader reads characters from a file while BufferedReader reads characters from another Reader. 1. “Java FileReader Class – Javatpoint.” Www.javatpoint.com, Available here. 2. “Java BufferedReader Class – Javatpoint.” Www.javatpoint.com, Available here.